This is Grace, or "Sister Grace" as I call her. She used to work at the Christian publishing house next door, but when there were huge lay offs a while back, she started up this little food stall outside the gate. She's a mother and grandmother herself, and was one of the first people to be patient with my poor Hausa when I was first taking Hausa lessons! She arrives about 8:30am and gets set up. I'm leaving about that same time for work and so I call out the morning greetings as I go around the corner to catch a keke. She brings out the large umbrella, her small plastic table and a few chairs, the propane stove, and the plastic buckets that hold her dishes and water for cleaning vegetables and washing dishes. Then she'll walk to the back of hte compound and fill a few buckets from the huge water tank, go around the corner to buy vegetables from the shops there, and go the local provision shop to buy a carton of Indomie (ramen) noodles and a crate of minerals (sodas). By about 10:30 she's ready for business and starts serving up meals to anyone who passes by. Her usual customers are the staff from the publishing house and the bookstore as well as office workers in the church denomination headquarters and the Christian guesthouse nearby. There are often many visiting pastors and Christian workers who've traveled to the city for a conference or some other meeting at the headquarters, and since they often go to the bookshop to buy Sunday School material or commentaries for their sermons, they'll find their way to Grace's shop. Some days, I'll be home from the hospital in time for lunch. In the keke on the way home I'm thinking through what's in my fridge that I can easily reheat on the stove (I don't have a microwave, and even then, our electricity is inconsistent). If I don't like my meal options, I'll eat at Grace's shop. As I come over, I call out the mid-day greetings and ask how the shop is going. I'll look through the plastic bucket on the table filled with cool water and bottles of minerals, choose one, and pop the top off with the opener hanging off the center pole of the big umbrella. 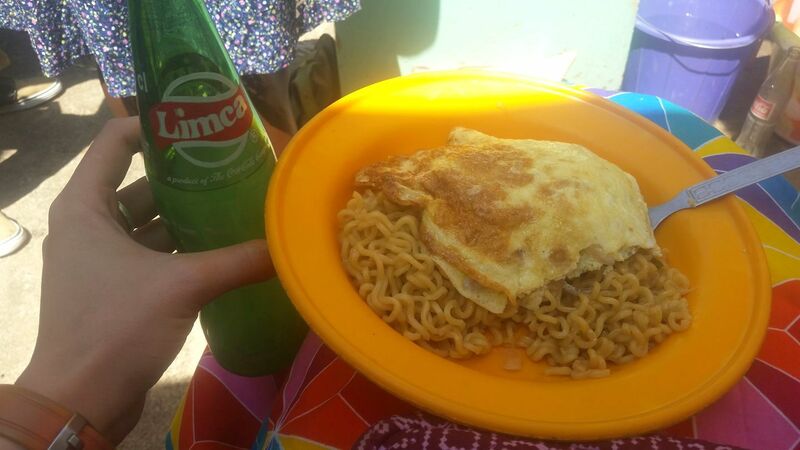 Then I'll find an empty plastic chair, sit down, and ask her to make me "Indomie and egg." She also serves a local salad made with cut up romaine lettuce, shredded carrots, sliced tomatoes, thin rings of purple onion, and heavily seasoned with a mix of Maggi (similar to chicken bouillon, but loaded with MSG! ), crushed peanuts, and salt. I haven't tried it because I'm wary of any vegetables that haven't been bleached, but I hear it's good! When I ask for Indomie and egg, She knows not to add extra peppe (finely ground red pepper that's in little tubs in the first picture), and will often add cut up carrots and onions to both my noodles and to the egg. Here, Indomie noodles are often served as noodles, not soup, so after the water's boiled and she's added the noodle packet, she will remove it from the stove and let it sit until the water has been absorbed. Then she'll start making my fried egg, using two to three eggs, a healthy amount of Maggi, and a handful of chopped veggies. Once the egg is done, she dishes the noodles out into a shallow bowl, slides the egg on top, and hands it to me. I'm halfway done with lunch--the bowl is usually overflowing with noodles and the egg is twice that big! Sometimes, there will be a pastor or two sitting and eating lunch there too. We'll usually get to talking (always him asking me a question first, as is culturally appropriate), and invariably the conversation will turn to President Trump. I will give my customary answer of "You know, I don't follow the news so well now that I live in Nigeria. So I'm not sure exactly what is going on right now. But I do know the Bible tells us to pray for those in authority whether we agree with them or not. I pray regularly for both President Trump and President Buhari." That answer usually satisfies them and means we can move on to another topic--often the weather and how baturi (white) people like the cold, the current fuel scarcity and it's resultant high prices and 2-day-long lines, or asking about how each other's Christmas and New Year celebrations were. The conversation wanes by the time I'm finished with my lunch, and then I'll ask Sister Grace how much I owe her (the price can change week to week as the price of eggs and minerals fluctuates), but it's around 380N ($0.79 USD). If I don't have small change (bills less than 100N), I'll sometimes pay for the pastor's lunch as well. That often sparks a small dispute with the pastor, but I will just say "We're all God's workers and it's all God's money anyway." I hand her back the empty mineral bottle, drop by bowl and fork in the soapy water bucket, thank her for cooking for me, say my mid-day goodbyes, and walk through the gate to my compound. Grace will stay until about 4:30 (most of the offices close between 4 and 4:30), then from my apartment I'll hear her bringing all of her stuff back into the compound and telling the guard at the front gate "Sai gobe" (see you tomorrow). I'm learning to love the rhythm of life here and all the people that make up that rhythm.